This Memorial Day, Aegis Living is proud and honored to care for many of our country’sveterans and military spouses across all of our communities. For their sacrifice and service, this aging community of heroes deserves dignity and respect as they move into their golden years. We are dedicated to their comfort and honoring their spirit every day. From all of us at Aegis Living, we humbly thank each of our veterans for protecting our freedom and serving our country. Among our many heroes, we want to acknowledge one special veteran – Art Peterson in our Aegis of Granada Hills. At 94, Art is helping his fellow veterans receive the recognition they deserve. Although many decades after their military service, Art has helped six of his comrades at Aegis Living receive the service medals that they earned but never received. 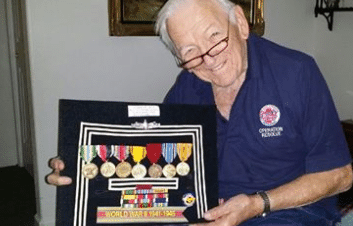 Art Peterson has made it his mission to track down their discharge papers and maneuver through the VA red tape to collect the service medals they deservedly earned. It hasn’t always been easy or straightforward, but Art has doggedly pursued and charmed the Veterans Administration Center in North Hills to get their medals delivered. Art was inspired by a cousin who was surprised on his 80th birthday with his service medals. It brought his cousin to tears and impressed upon Art the impact and importance of these medals, even after so many years. Art served in the Navy from 1943 to 1946 in World War II in the South Pacific and Guadalcanal. He spent years working as a labor relations troubleshooter for Hughes Aircraft. Now, he works tirelessly on this new mission while retired and living at our assisted living community in Granada Hills. At Aegis Living, we are so grateful for his dedication and compassion for his comrades. In fact, now there’s talk of Art Peterson helping veterans at other communities in Southern California. Inspired by our many residents who have served in the military, Aegis Living is proud to announce a new way to honor our veterans. We are introducing the Aegis Wall of Honor on our Aegis Living Facebook page. It is our way to recognize those who have served in the military for all to see. If you would like to honor a friend, family member, or loved one, submit a photo of that person with a short paragraph describing their service and why they are special to you. Visit our Aegis Living Facebook page to submit your information and to see our growing Wall of Honor.